I have never read a book by Michell McKinney Hammond, which ended on the note of disappointment. She is always on point as far as I’m concerned. From her novels to her books on relationships, finance and being the lady you envision and have always wanted to be. Anyone remember the Diva Principles? Hammond knows how to make life real on the pages and she tells it like it is, every rule you can imagine, she breaks it with her direct approach. 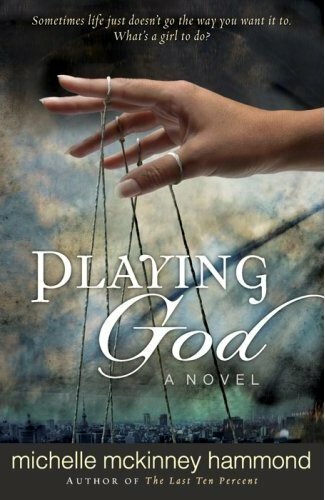 She has done it again and is on form with Playing God, her second novel. What an absolutely brilliant, brilliant, brilliant read. Tamara, Corinne, Lydia, Jada and Jamilah, five women, whose lives are intertwined by tragedy, faith, hope, love and God. Tamara is the psychiatrist everyone in Christendom goes to with their issues, unknown to them, she is close to breaking point and has had enough of the waiting on the God game for the right life partner. Corinne is your drop-dead-gorgeous pastor’s wife, if only her congregation knew her husband’s secret. Jada, their teenage daughter is paying for the sins of her father at the hands of his co-pastor, who is blackmailing the young lady for his own sick pleasures. Rather than face her reality, believe it or not, the pastor’s wife turns to Bourbon, that’s right, she finds solace at the bottom of the bottle. Jamilah, is a passionate school teacher with a big heart for Ari, one of her students but her care, love and concern for this one pupil stands to cost her a whole lot more than she bargained for. And, my world, what can I say about Lydia, the strong black woman, who does not take crap from anyone until she finds herself man-less and realises there is a difference between being a strong black woman and having a nasty tongue and attitude. Hammond has the juice flowing with Playing God and I can relate with the issues her characters are all exploring in their lives. Tamara struck a chord with me, done with the whole waiting for the right man sent from above, she decides to let go and help herself to the first available man, who comes along and makes her feel like a woman. Unknown to her, Kevin is well spoken for. Let’s just say Tamara gladly breaks all her relationship rules for the purpose of living in the moment or should that be denial. Hammond reminds you of the real life stories you have heard about people you know, who got carried away, thinking they had met the one, only to find out they were so wrong, they gave wrong a whole new meaning. As for Corinne, it takes a life or death situation for her to get her priorities right and stand up for herself and her daughter. Jamilah learns that you cannot break the law without paying a price and Lydia, well, daddy’s little girl had some daddy issues to deal with, so she could learn to love and trust. An absorbing and worthy read, with insightful lessons about life; Hammond really does open your eyes to the issues which everyday people face, christian or not. She takes the mask off. This is what I love and appreciate about her style of storytelling, she gives you real characters not some perfect human beings, who qualify for sainthood. They make their mistakes and learn. Some don’t get off lightly, they pay a bigger price for their role in the mess they find themselves, after all, you do the crime, you do the time. Bottom-line, you cannot play God with your life and blame other people for it. You have to take responsibility for yourself and your life. If you liked/loved the Last Ten Percent, Hammond’s debut novel, you are going to fall head over heals for Playing God, she does not miss a beat. And I don’t feel guilty about not doing any work for one day to read this fine offering from Hammond, time well spent, great lessons learnt. I’m already looking forward to her next novel. This entry was posted on Monday, January 3rd, 2011 at 1:57 am	and is filed under Book Reviews, Life, Marriage & Relationships, Musings, Musings, Spirituality. You can follow any responses to this entry through the RSS 2.0 feed. You can leave a response, or trackback from your own site. Thanks Myne, she is very interesting and a fab writer in my book. I too haven’t read any of Hammond’s works. It sounds quite interesting. Wow, her books are always on point. Indeed michelle is a blessing to womanhood.The last ten percent, what to do till love finds you-totally fabulous.